I could not be more impressed with the looks of an aircraft. The real Starfighter is a stunner to me. The VSN aircraft uses the F-15C pit and thus has a radar capability that the real thing never had (Im guessing). You get everything from Aim9m to Aim-120 Slammers. The gun is the same as the Eagle so it fits. I did a few dogfights and tooling around. It turned out to be a nice mod. You can even put weapons on it with either the ground crew menu or in ME. Just create a new loadout if in ME. Here is some eye candy. So far the Mod has given me not problems. You can take plenty of fuel or…x3 Sidewinders in the center, four Sidewinders per midwing or a Sparrow and two sidewinder or sparrows in the wingtips. She can carry quite a load. No A2G is given. The Visuals are all there. It gets a good bit of vapor over the wings when you pull hard. Swatting down Fishbeds was easy and fun. There are a few skins here and there. Here is the German Marines. Thanks to VSN for this great FREE MOD. In fact “Marine” means Navy so it is the German Navy. I was always wondering why the Marines needed a fast jet like that. Thanks for clearing that up. Nice mod but still not feeling it. Is it a different flight model entirely or are we literally looking at a skin for the f15? I can’t help but love the looks of that thing. Such a gorgeous thing. I’d love that, but it isn’t very likely. I know the guy who did all the VSN planes (he is active on lockonforum.de), and none of them has a cockpit. It is more of a fun mod for AI planes and making videos. And YES, Im learning to fly the F-15 all over again, in a different body. It is just fun. Any chance of some pics from inside? None. I’m in India. But I will tell you. The cockpit is the F-15C. Of course, when you look outside you see the 104 wings, nose ect. I could not get AP functions to work. I doubt Starfighter had AP. I agree with the comments that I’m flying an Eagle w a 104 skin. This is not the Starfighter from Strike Fighters. Anyways, a free mod. And it has interesting a2a weapons load. it’s ok. Thank you so much for the answer anyway! So there’s no modification to the Flight model at all? I don’t know about this one specifically, but in the past the other VSN planes usually tried to get somewhat close to a few of the real numbers for each plane (within the limits of the SFM and time). Some are good, some are not that good. I’m no expert. I just dont think so. It’s way to maneuverable. It’s a fun mod an there is an Italian skin so do not deprive yourself. Fake 104 is better than No 104 at all. 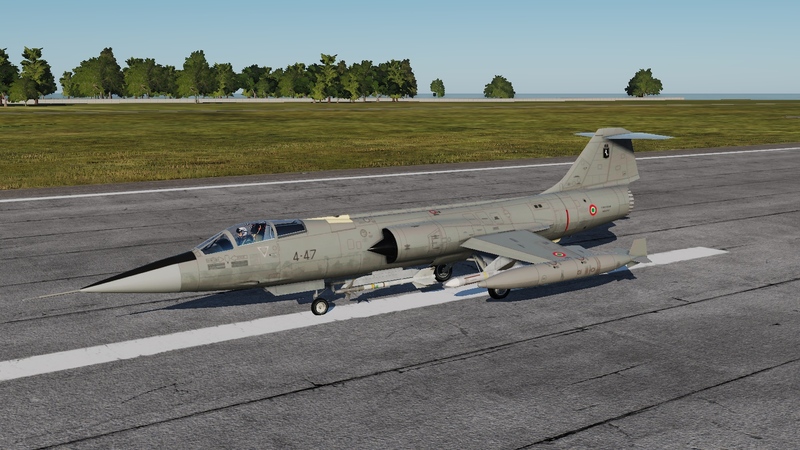 Lockheed F-104 Starfighter in the livery of the Italian Air Force, 4o Stormo (4th Wing) for the VSN F-104G mod.